It all started in 2008, when I was in the eighth grade and was doing what most thirteen-year-olds do, sitting on the couch, watching TV. I remember watching one of those “American Idol Gives Back” programs and being incredibly impacted by the poverty I saw many kids going through. I ran up to my room and grabbed all fourteen dollars’ worth of my savings to give to the kids I saw in those videos. I wanted to do anything I could to help. I remember watching a commercial about a twelve-year-old African boy. He had younger siblings but his parents and grandparents had died from HIV. He was the head of his household. He had to protect his siblings, provide food for them, and care for them. Being thirteen at the time, I couldn’t imagine taking care of my little sister that way. I couldn’t imagine life without my parents, without my bed, or without a promise of food. I desperately wanted to do something to bring kids like that hope. I looked at my life and felt so grateful and so undeserving. Why have I been so privileged? What could I do to help? ​In my eighth grade social studies class in Connecticut, we had one big project for the year. We had to research a world problem and then do a service project raising awareness about it. After being so impacted by what I had seen on TV, I decided to research orphans in Africa. I wanted to make an impact and change the lives of the kids that I was learning about. But how could I really do that much to make a difference at such a young age? I had no money, I wasn’t famous, I didn’t have big influence, and my voice had barely even changed for pete’s sake! How could I really make a difference? So I started to look at the things I did have. First, I knew that I had an awesome family. My parents and little sister are truly my heroes. Their lives are inspiring and they have been the backbone and foundation for so much of what my life has become. I knew I lived in a privileged town that had awesome schools. And I knew that I LOVED basketball. 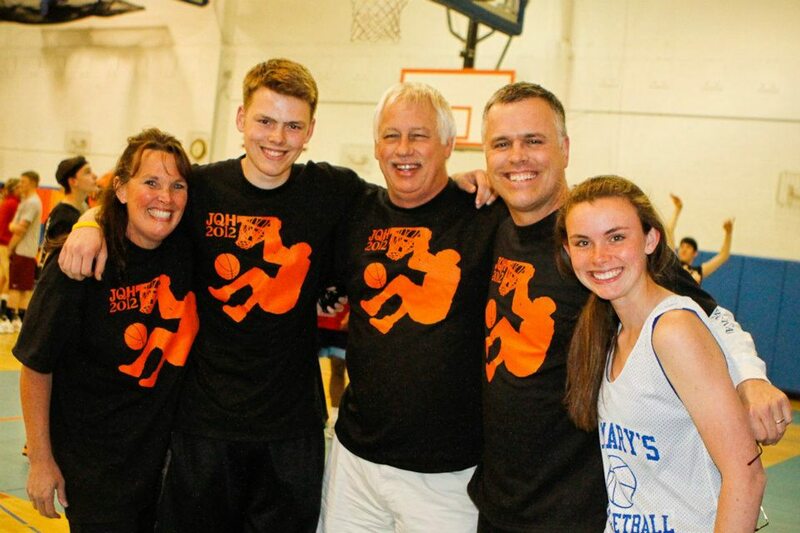 So I decided to start a 3-on-3 basketball tournament, called JamQuest, to help orphans in Africa. Partnering with HOPE worldwide, we were able to raise about $2,700 for orphans and vulnerable children in Kenya and about fifty people came out to our tournament in 2008! As an eighth grader, this was an incredible victory! It showed me that I really could do something to change the lives of kids across the globe! I didn’t have to be rich and famous to influence people. All I had to do was use what I had, do what I loved, and do it for others and watch miracles happen. It gave me a vision. JamQuest showed me that there is an incredible amount of power that comes when kids try to help other kids. It doesn’t take anything huge. When one kid chooses to bring faith, hope, and love to another kid, a whole community is impacted and inspired. Our first JQ event ever in 2008! Fifty people came out to support and we raised $2,700 for kids in Kenya! So I kept dreaming. Over the next few years, JamQuest grew in ways I never thought possible. Our whole town rallied behind this annual tournament – more like a huge party – to help kids in need. We raised thousands of dollars for the education of Kenyan kids. Hundreds of people were involved. I was able to go on TV and talk about our story. Along with Dr. Mark Ottenweller, we were the main speakers for middle school and high school assemblies. NBA and NFL players got involved. Other kids around the nation started their own JQ events in their cities. I got to speak at big conferences and teach classes. We won awards and gained incredible support. I was blown away by where God had taken it. My family with Dr. Mark in the middle. Speaking at a conference about serving the poor in front of 1,200+ college students. In 2015, I finally got to go to Kenya to see some of the kids we have helped. Seeing those guys for the first time overwhelmed me. They are incredible young men and women. They are my heroes. They talked about JamQuest changing their lives and receiving hope for the first time. I was completely inspired that God would use me to impact their lives and it motivated me even more to help kids around the world. I realized that changing the world isn’t about giving those in poverty a more “Americanized” lifestyle, but it’s about instilling someone with faith, hope, and love and inspiring them to do the same to others. Everyone has the ability to do that. Every person can truly change the world by making a difference one person at a time. It’s not complicated. It’s simple. Use what you have, do what you love, rally your squad, and do it all for others. JamQuest has given me belief. It’s given me the belief that we can really change the world together. Right now there are 2.2 billion kids on the planet. One billion of them live in a cycle of poverty. When one billion kids choose to help those one billion kids in poverty, one kid helping one kid, we can inspire the globe. We need a new generation of young leaders that are going to rise up and live their lives in fearless service. JamQuest showed me that it’s possible. So let’s change this world together. ​JamQuest Hoops is a registered 501(c)(3) non-profit organization.